Over the past decade, smile makeovers have become increasingly popular with people from all walks of life. A smile makeover is any combination of cosmetic dental treatments provided concurrently with the goal of dramatically enhancing your appearance and self-confidence. Your dentist will plan your smile makeover based on your individual needs and may recommend a combination of cosmetic bonding, teeth whitening, porcelain veneers, or tooth-colored fillings. The smile makeover process at Central Dental is entirely collaborative. 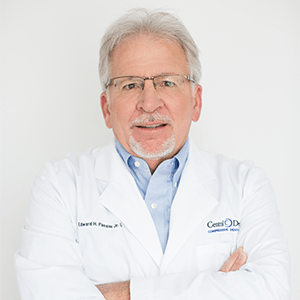 From your first consultation, Dr. Edward Passini will work closely with you to help you choose the treatments best suited to perfect your smile. Goals, concerns, and preferences will all be discussed with you during your consultation. You may wish to use photos of your favorite smiles to point out the characteristics you would like for your own smile. Your input is valued and respected at each stage of your smile makeover process, and no decisions are finalized until you have had a chance to view a wax-up of what treatment can provide, and have given us your approval. This empowers you to have the final say in what you want your smile to look like. Your doctor can revitalize the health, beautify the appearance, and restore the function of your teeth allowing you to realize the smile of your dreams and the freedoms and joys that come with it. Your smile is of paramount significance. It is often the first thing people notice upon meeting you and can leave a lasting impression on friends and strangers alike. Your smile plays a key role in your overall confidence and self-esteem. An attractive smile can improve your demeanor, make it easier to socialize and diminish anxieties or insecurities. If you’re unhappy with your smile now is the time to make a change. Reserve your smile makeover consultation with Dr. Edward Passini by filling out the form below. You can also reach our Little Rock office at (501) 225-1577 and our Conway office at (501) 327-6453.